As we’ve written about in the past, one of the wonderful advantages of owning one of Frank Lloyd Wright’s American System-Built Homes is becoming part of a network of stewards who are interested not only in their own home but in the ASBH project as a whole. Over the past five years of ownership of the Meier house, we’ve had the privilege of spending time with many ASBH stewards in their homes. 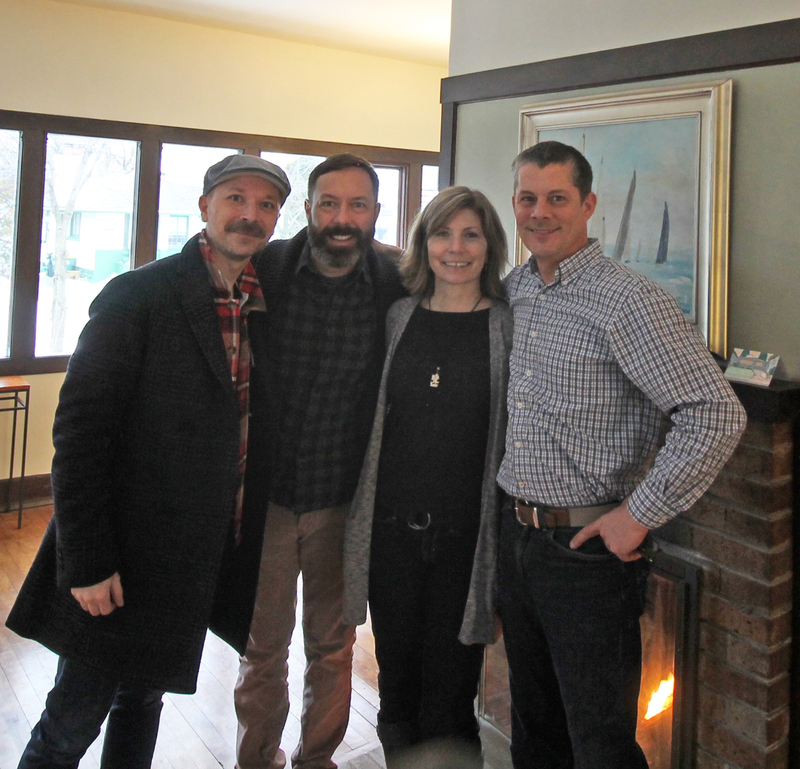 We meet to share stories and compare notes, to break bread and break down history and, of course, to give tours of our homes. 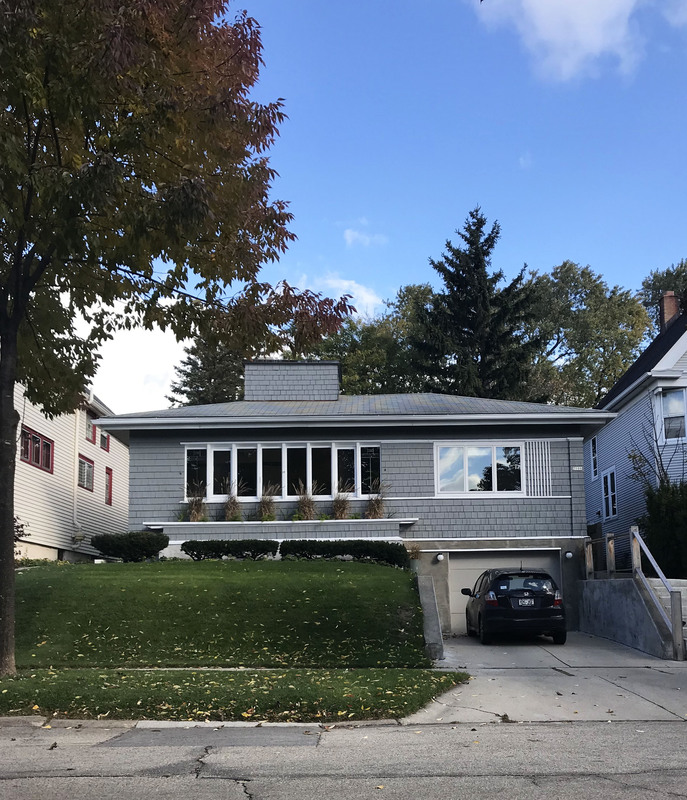 This past weekend, we visited one of the homes that’s a more recent addition to the roster of American System Built-Homes – the Elizabeth Murphy House in Milwaukee, Wisconsin. The home’s current stewards, Angela and Nick, have owned the home for just a couple of years but they have already made their imprint on the house. They were kind enough to welcome us into their home, share what they’ve learned and even feed us a delicious vegan soup. The Elizabeth Murphy House is a Model A203, a small two bedroom cottage that comes in at a little over 900 square feet. The exterior has been clad in siding since the 1930s, a fact that probably helped disguise the house as an ASBH for many years. From the street, the house looks more like a Cap Cod than a Prairie-style ASBH, but at closer inspection one can identify the hallmarks of Wright’s prefab homes. If there’s any doubt that this is an American System-Built home from the outside, one only needs to walk through the front door (which is actually at the side of the house) to recognize its provenance. Unlike our house, which has seen a number of exterior and interior changes over the years, updates to the Elizabeth Murphy House stopped at the front door. The original woodwork and built-ins – including kitchen cabinets! – are still in place and replete with their original finish. One of the drawers in the built-in cabinets in the dining area is actually stamped with the Richard Company’s information. As you might recall, Frank Lloyd Wright had partnered with Arthur Richards for the ASBH project. Finding Richards’ name on the inside of a drawer was one of the first indications that this is indeed an ASBH project. Whereas the pebble dash stucco on the exterior of the house is hiding under siding, the stucco on the sunporch still sparkles in the light of day. It was amazing to see a sunporch with the original stucco extant. The sunporch on our own house, which is much smaller than the sunporch at the Elizabeth Murphy, is also lined in stucco. But our sunporch had been painted at some point over the years. And now we might know why a previous owner may have chosen to paint it. Nick and Angela have a can where they collect little pieces of stucco that fall off the walls. Indeed, brushing up against the stucco, as we discovered when painting the exterior trim on our house, can send pebbles and quartzite flying. With a sunporch as small as ours, a previous owner who had brushed up against the wall one too many times may have tired of cleaning up the fallen pebbles and decided to paint. There’s a lot of history and many stories to tell about the Elizabeth Murphy House. But we’ll leave that to Nick and Angela to share. They’re blogging and Instagramming so do follow them to learn more about their home. 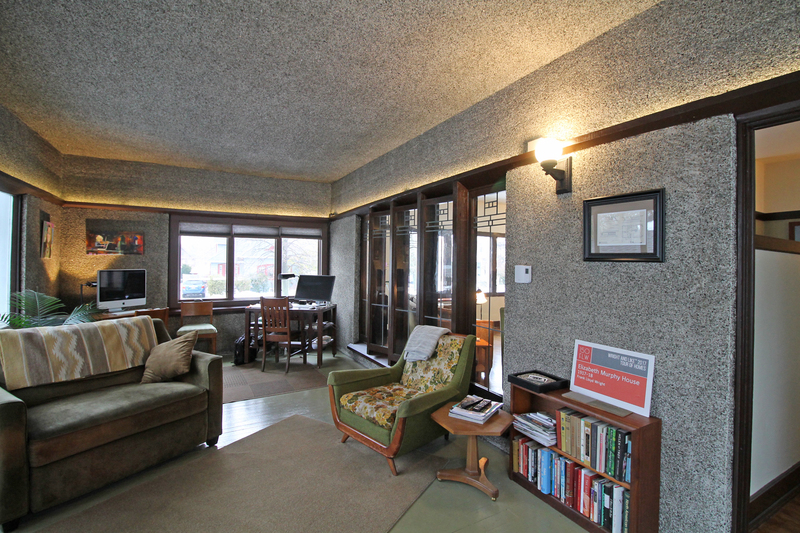 This entry was posted in American System-Built Home, Famous Places, Frank Lloyd Wright, travel on 02/04/2019 by Jason.